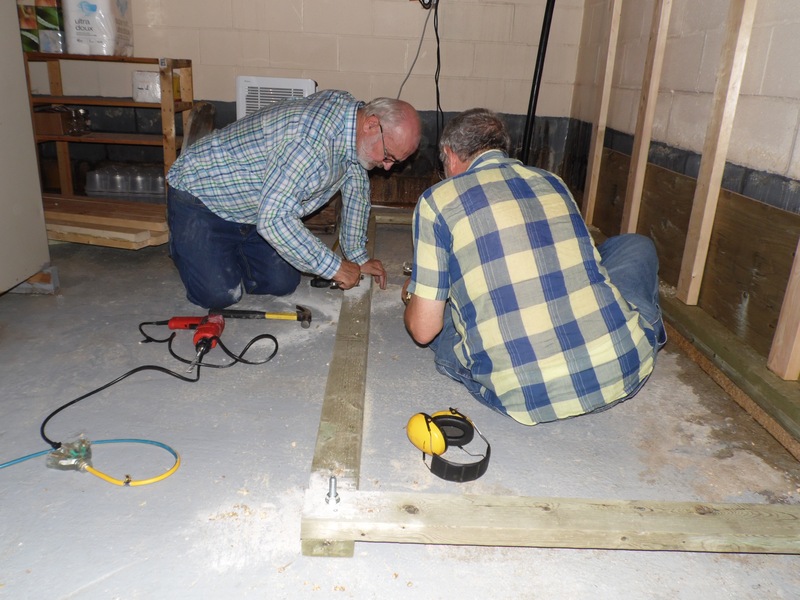 Work continued on our shelter. 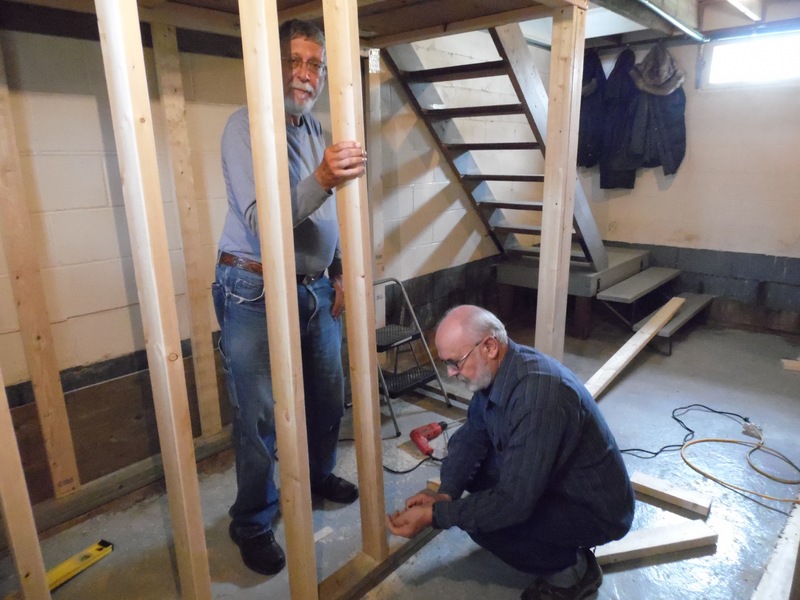 The framing is done and the men moved to the door. FEMA has an entire pamphlet on the door for a shelter because the shelter is only as good as the door. You can have the best shelter there is but if your door is weak you’ll end up like the father of the lady scientist in the movie Twister, sucked up for some close and personal encounters with the big one. 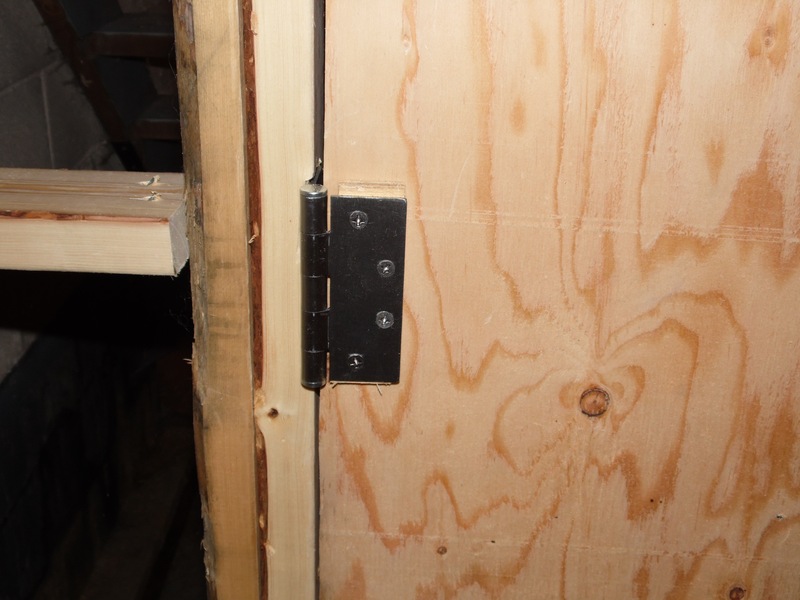 After checking the diagrams FEMA has, our engineer decided we would need to make a door with the same specifications as the walls, two layers of 3/4 inches plywood glued together and then screwed together. We went to the lake for a swim while we were waiting for the glue to set. It was so pleasant we stayed to watch the sunset. Back to work. The door needs some heavy duty hinges, and then it would need to be framed into the structure itself, so that even with extreme sucking it would not be able to open outward. It would also need some fancy deadbolt hardware on the inside. Given the design, the basic door had to go in before the layering of plywood and framing on the outside. Industrial strength hinges with the screws also glued in to make it strong. By this point we were out of wood and Bryan has to leave for a visit with family. He’ll be back in a week and we have plans to go to a country music concert weekend. 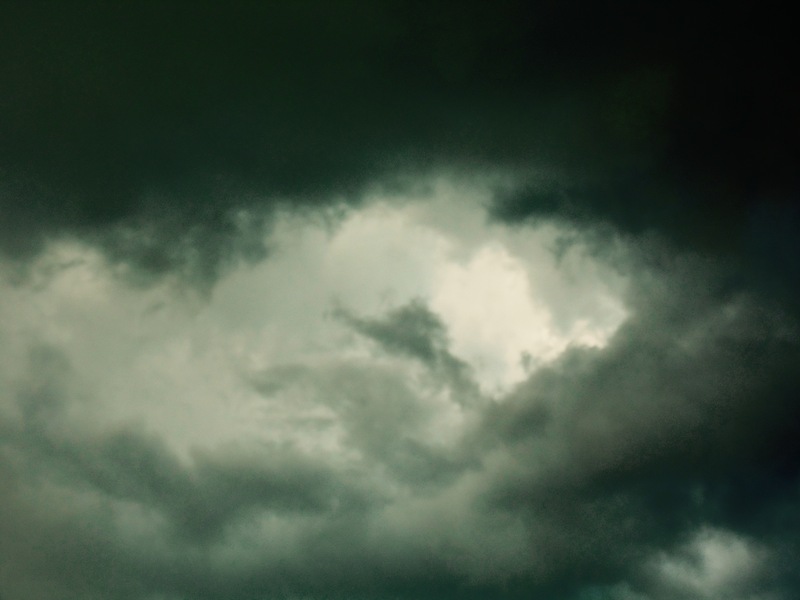 This morning we were awakened by thunder storms. A quick check of the radar showed severe storms approaching fast. Then we had some fun watching more rotating clouds overhead doing the eery green thing while Environment Canada issued warnings. Wow it came up fast! Twenty minutes between nothing on radar and then this strong storm. It passed us by, dumped a bunch of golf ball sized hail into the lake 12 kilometres east of us, and we are now sitting in a severe thunderstorm watch with more storms expected later today. Ever feel like you’re in a bulls eye or someone is trying to give you a message? We had planned on waiting until next month to purchase the next $300 or so of stuff we need to finish the shelter. However the forecast is for extreme heat (35C/95F) until Saturday and then an approaching cold front will mean yet another round of severe storms. So we may yet decide to buy the rest on the line of credit and finish this thing for Saturday. For today though, we will just get caught up on other stuff. Having company is great. Having a project to build is a lot of fun. Still we are behind on a whole bunch of little things, there is sawdust everywhere in my house. All the floors need washing. Time to get to work. 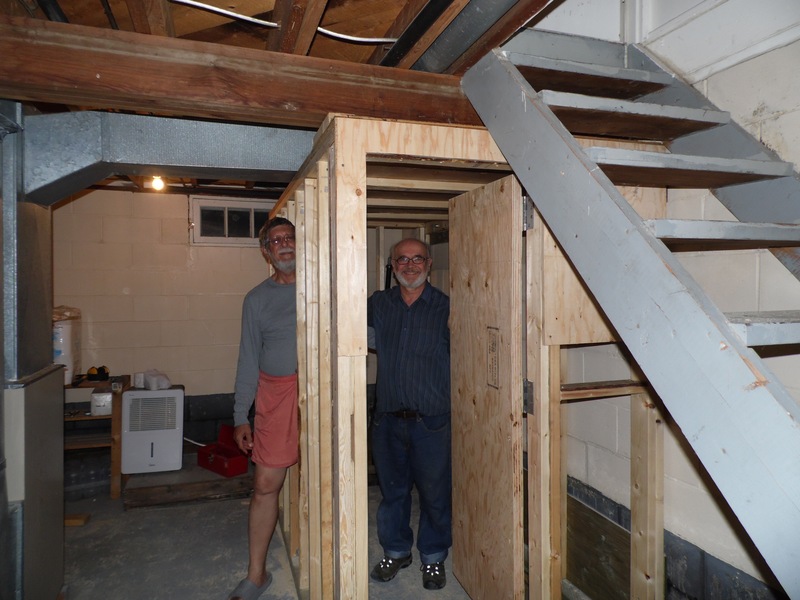 This entry was posted in Frugal living, tornado shelter and tagged Manitoba, Rural living, Severe Weather, tornado shelter on August 12, 2015 by tumbleweedstumbling. 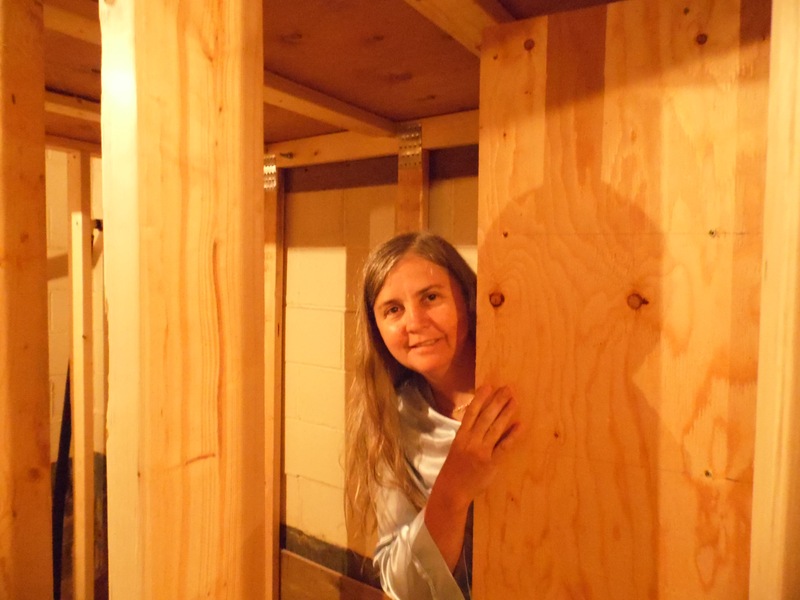 Work on our basement closet/tornado shelter continues. We had some delays yesterday. We needed to borrow some tools and that took some scrounging around town. This meant we had folks come to see what we were up to. Naturally, we needed to break out a beer or two to keep the conversation moving. Then we had to wait for the beer to wear off before we went back to work. Saws and beer don’t mix. But, finally, we did get back to work. These metal plates with nails add enormous strength against uplift. One way tornados kill is that the tremendous uplift rips off the roof. Once the roof is gone, the rest of the structure collapses onto anyone down below and then if that doesn’t kill you, the tornado blenderizes all that wall material and stuff inside and then shreds everything down to deadly missiles. (I read a tragic story of a two year old who died because a doorknob got inserted into the back of his head by this force. So heartrending!) 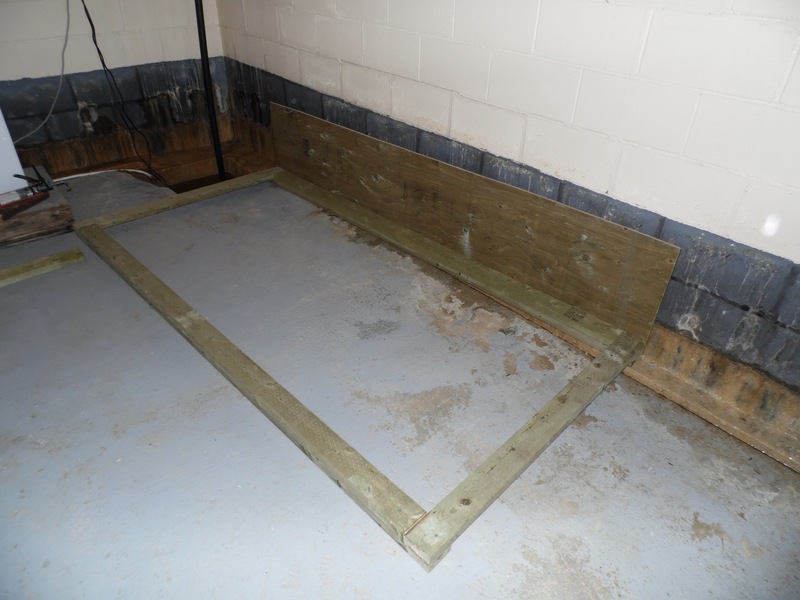 These strengthening plates are added at all the points where the roof meets the side frame. These plates are also cheap and easy to install. I took on the assignment of hammering in 125 nails into six plates for the back wall which is against the concrete block basement wall. The total cost of plates and nails was under $15 from our local Co-op. It’s little touches like this that greatly increase the strength of the structure with minimal additional cost. You do have to plan these things into it though. You can’t just wing it. It’s been fascinating watching an engineer plan and then see the plans come together. Our friend Bryan read the plans provided by FEMA and studied some of the diagrams and stats on force and uplift of F0-F5. His eyebrows went up and his eyes went wide a few times as he read. Twice he actually whistled in awe. Yes, tornados are vicious beasties. No doubt about that. To me, the neat FEMA diagrams looked like strange goblety gook lines in black and white but he understood them. He speaks that language. And all of this knowledge and experience got built into the design. So I recommend that if you want to build one of these reinforced sheltering areas, it would be a really good idea to involve an experienced engineer. First, to make sure the thing holds up against a monster storm, second to save money, and finally, because each place one of these shelters needs to be built in requires special modifications to fit the location. I could have built a closet myself but I could never have come up with this design. We are doing the framing now. The studs on the outer wall are spaced every 12 inches instead of the standard 16 inches to increase the strength of the walls by 50%. Since the studs cost under $4 you get a great increase in strength for very little additional cost. The other cheap strength improvement is that all the screws are getting glued in with special construction glue applied before insertion. So you get not just the power of the screw itself, but also the adhesive and that adhesive is really cheap too. Such things do add time. And the door will open inwards and be partly under the stairs. Our stairs are very well built with dove tailing where the stair is inserted into the stringer so they will take a lot of force. This makes it less likely we’ll be trapped if the building collapsed. We would be able to open the door with greater safety and have a chance of getting out once it’s all over and the storm has moved on. I sure hope we never have to use this closet/tornado shelter. But if we do, we’re going to have it. I have always been of the opinion that if you prepare for events, they don’t happen. So my little superstition means putting our shelter in, will actually prevent a tornado from coming. 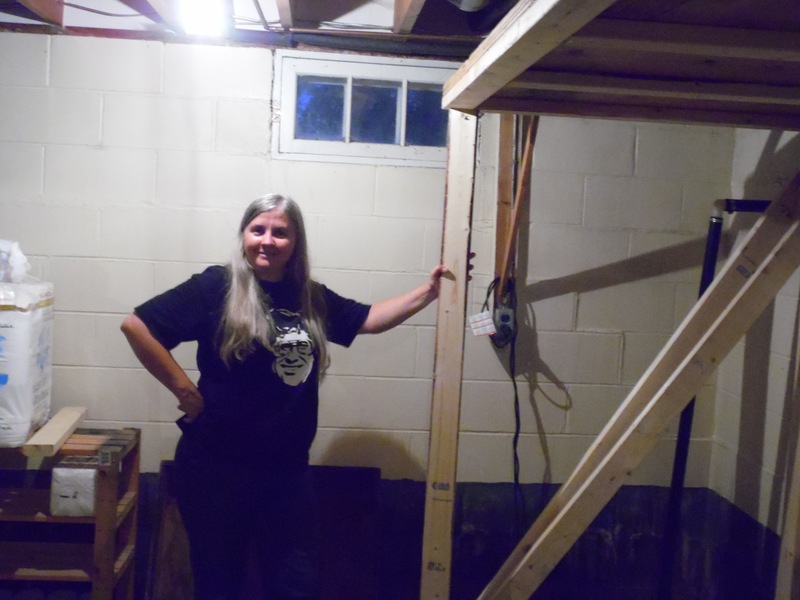 This entry was posted in Frugal living, tornado shelter and tagged Frugal Living, Manitoba, Rural living, Severe Weather on August 11, 2015 by tumbleweedstumbling. 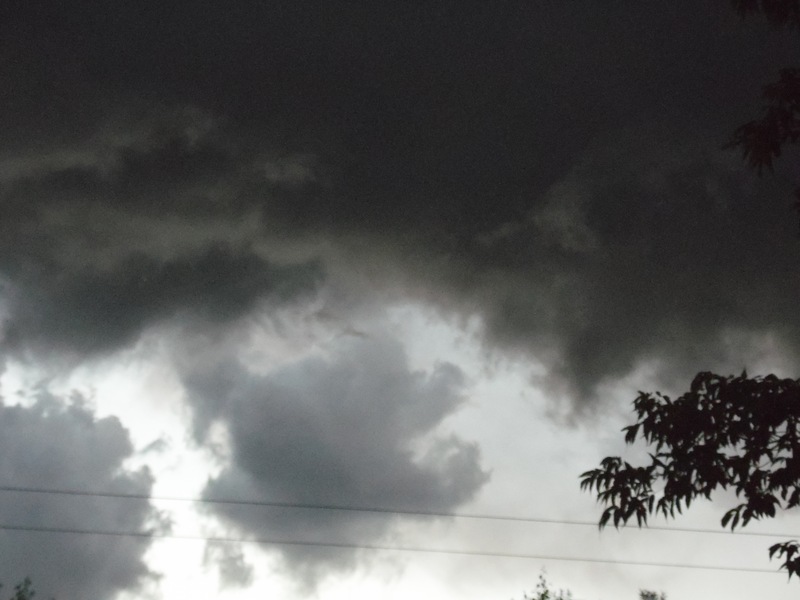 This is some lovely rotating clouds we saw from our front porch during a severe thunderstorm. Fortunately the rotating never organized into anything, but it sure makes you think. The roof needed to be made in advance and so we made it from 2 sheets of 3/4 inch plywood. 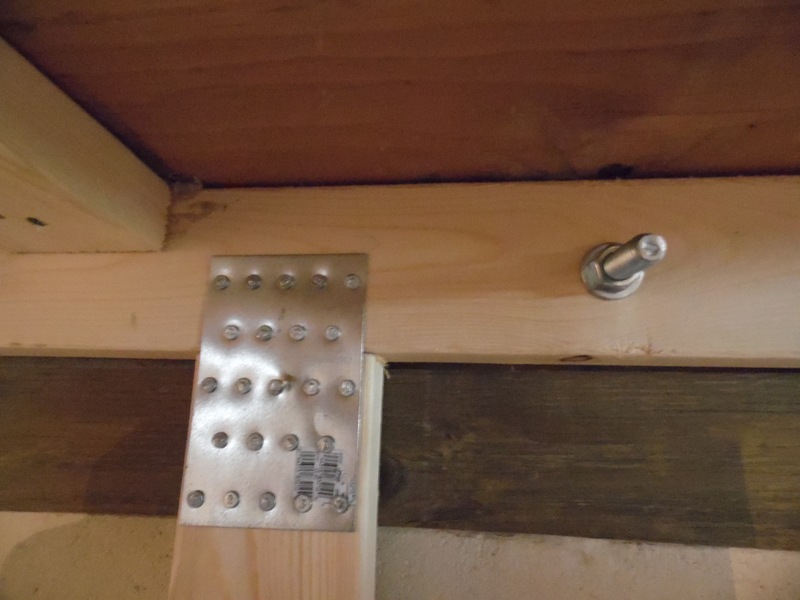 These were glued together and attached to a frame of 2X4s.If we decide to upgrade to an F5 suitable shelter we will add 1/4 inch steel sheets. I don’t think we’ll bother though. The cost would be huge and the risk, while not zero, is extremely low. We have a very high water table anyway and with heavy rain we get a lot of water. If the sump pump fails the basement fills with water to the height of the black on the bricks. So the flooring has a one inch space for water to flow to the sump pump. During a severe thunderstorm, a space like this can swiftly fill with water from inches of rainfall so we have to plan on being wet. 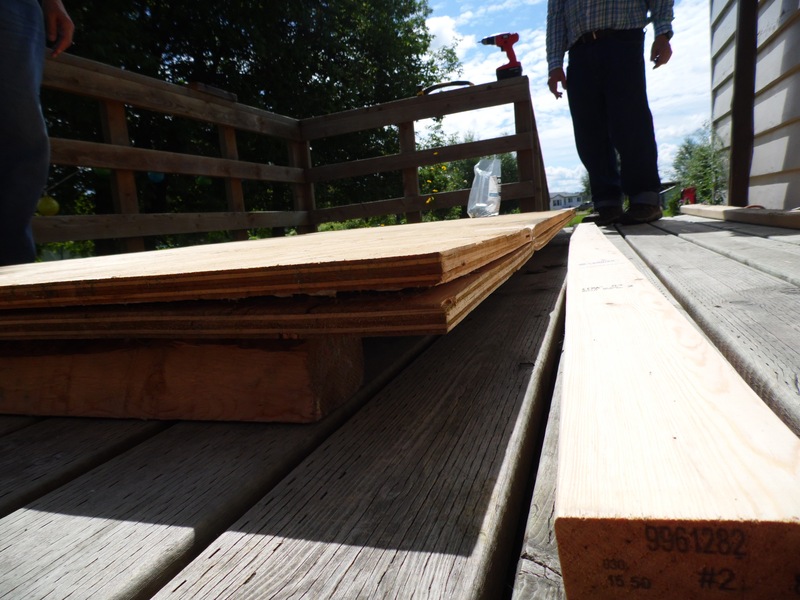 Because of the wet, the bottom most layer and everything that touches walls is made from treated “preserved wood foundation material” lumber. We have also purchased an emergency back up sump pump that will run on DC power since any severe weather will likely mean the electricity is out. There will be a deep cycle marine battery in the space. We will also have lights from the battery. 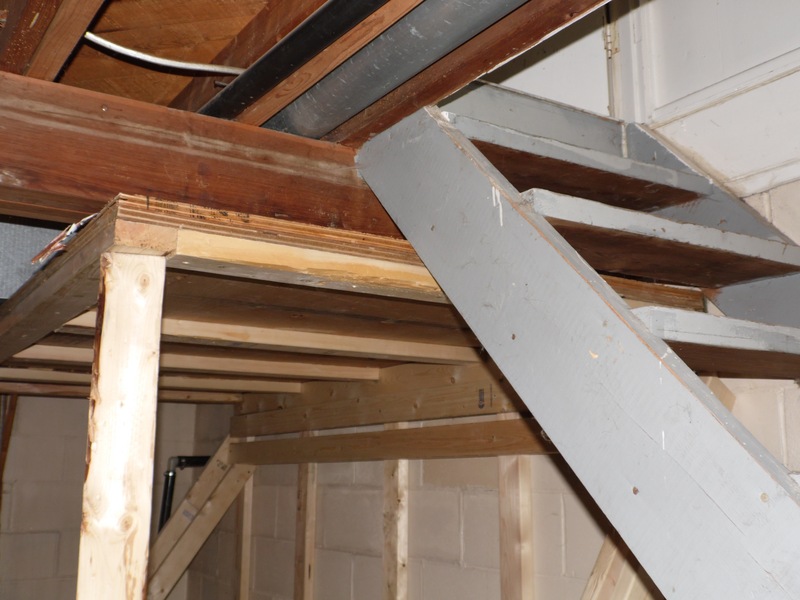 We originally were planning on bracing the roof into the beam of the house itself. But according to FEMA it’s better for the box to be self contained and not attached to the house in case the house gets moved off its foundation. So the box frame is bolted to the concrete with special 1/2 inch concrete anchors at six points on the floor and four on the roof where it attaches to the cinderblock wall that will act as the fourth wall. Each concrete anchor can take 1000 pounds of force with ten bolts we have 10,000 pounds. It’s not going anywhere any time soon. It would hold very nicely for an F2, F3, the kind typically found in Manitoba) and probably an F4. It might even be good enough for an F5 providing the tornado passed over very quickly and didn’t sit on us churning, since we are also below ground level. Now the roof is in. It’s all framed with temporary frames and bolts until the main interior framing is completed. I can’t say we worked all that hard. We took lots of breaks, had a rather leisurely dinner and we didn’t start until after noon. Plus we had an afternoon nap. We finished to this stage by 9:00 pm. 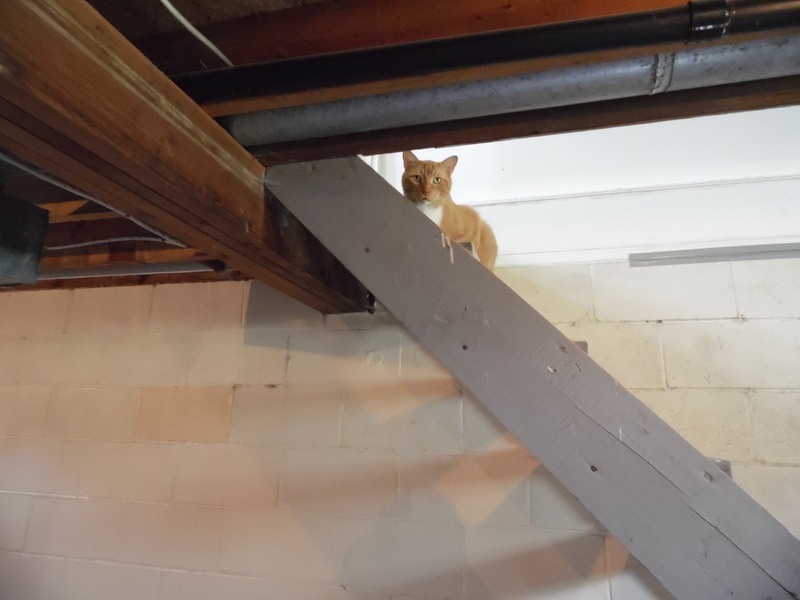 This entry was posted in Tornado, tornado shelter and tagged Frugal Living, Manitoba, Rural living, Severe Weather on August 10, 2015 by tumbleweedstumbling.